Instead of throwing out your yard and kitchen waste, why not recycle it? Composting is a great way to help your garden thrive, while decreasing the amount of garbage that ends up in landfills. With a cost-effective and easy-to-use system from TekSupply, you can start composting today to save money on fertilizer and decrease your environmental footprint. Composting is the decomposition of organic materials that creates a nutrient-rich soil known as compost. You can compost anything that was once living, as it will decompose. Starting your own backyard composting system is a great way to return nutrients to the soil by using the same process that naturally occurs in the environment. Composting is carried out by tiny microbes found in your kitchen and yard waste. Organisms such as fungi and bacteria digest the waste, creating a gritty, dark soil. If your compost pile is somewhat cool and exposed, worms and insects can help with the composting process as well. Though eventually microbes will always turn the waste into compost, you can speed up the process by creating ideal conditions in your composting location. Much like humans, the microbes need air, water and food to thrive. Microbes are aerobic meaning they can only survive in an oxygenated environment. If sufficient air isn't available, composting will be taken over by anaerobic microbes, which slowly decompose your pile but cause a terrible smell. To avoid this, make sure it is easy for air to enter your pile. This is done by checking to see that any composting materials that mat down, such as wet leaves, are broken up and mixed well. To keep the air flow going, turn your compost regularly. 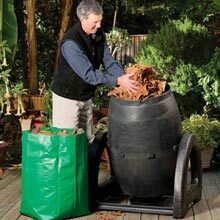 Most composting systems from TekSupply have a mechanism that makes turning compost very easy. Water is important to the microbes as well. Compost piles should be damp throughout because that makes it easier for the microbes to move around. Compost that is too wet will prevent sufficient air from entering the pile, and dry piles will slow the process significantly. Since composting is done by microbes, it makes sense that the organisms would need some sort of "food" to keep the process moving. Composting microbes need two major types of food in the pile or composter. The first type, known as browns, consists of dead, dry plant material like leaves, woodchips or straw. The browns keep microbial energy levels up. We recommend that these materials are dampened before being added to the compost pile because of how naturally dry they are. The microbes also need greens, which provide them with protein due to their high levels of nitrogen. Greens consist of fresh, green plant materials like vegetable scraps and grass clippings, as well as horse manure, tea bags and coffee grounds. Make sure to keep a good balance of browns and greens available to the microbes to keep process moving at a steady pace. Anything that was once living can be composted, but that doesn't mean that you should compost everything that was once alive. To start, be sure you have a good mix of browns and greens in the pile or composter. If you are looking for some greens to add, try grass clippings, kitchens wastes, manure, green leaves and weeds. When adding grass, be cautious that it is used in small amounts and mixed well because it tends to mat down. Your kitchen wastes, like vegetable scraps, coffee bags and egg shells are very high in nitrogen, making them perfect food for the microbes. Any of your kitchen scraps should be mixed with plenty of browns because they are moist and heavy. Manure from horses, cows, sheep and other livestock are great for your compost pile. It is high in nitrogen, but if you don't allow it to decompose for long enough it can burn your plants, so be sure the composting process is complete before using it as fertilizer. Weeds and yard waste should be composted carefully, as weed seeds will survive the composting process more often than not and can even sprout again in the pile if they aren't truly dead. For some browns to add to the pile, look for hay, dead leaves, straw and wood waste. Hay is a great material to compost and is usually readily available. Hay should be moist before it is added to the pile. While alfalfa hay is high in nitrogen and decomposes well, be careful to minimize the grass hay you use because its seeds can re-sprout when the compost is added to your garden. Dead, dry leaves are perfect for compost piles, but should be added in small layers because they can clump and block airflow. Dry straw, on the other hand, will create little pockets for air to travel through but should be kept moist so the process won't be slowed. Wood waste can be used for composting, but carefully because many types of wood are slow to compost and will hinder the process. We recommend using only the wood from broadleaved trees. Just as there are many things around your house and yard that can be added to the compost pile, there are a good number of wastes you should stay away from. First, wood chips can be used unless they are chemically treated. Chemically-treated wood can add arsenic to the compost pile essentially poisoning your plants when you fertilize them. Also, be careful not to add material from plants that look diseased so you won't infect your garden. Manure should only be used from livestock, as mentioned above. It is critical to avoid composting any human, cat or dog waste as they spread pathogens that can make people very sick. Last, any meat, bones or fats from the kitchen should be sent to the landfill. These are slow to break down in compost piles and may attract unwanted pests. If you have any questions on whether or not something should be added to your composter, we recommend seeking help from an expert or Contacting Us. What are benefits of composting? Composting has many important benefits. One major benefit is the reduction in waste that gets sent to landfills. Not only are landfills becoming too full, but when your kitchen and yard waste decomposes there, methane gas is given off into the atmosphere. Composting your waste not only saves you money, but it is very environmentally friendly. Another great benefit of composting is that it provides a cost-effective, nutrient-rich soil for your crops. Unlike synthetic fertilizers, compost can add organic material to your soil which will help it retain more water in sandy soils and drain more water in clay-like soils. Mixing compost with your soil adds microbes to your soil as well. Microbes take nutrients from the soil and pass them to your crops, assisting in their growth. Compost is a cost-effective alternative to using chemical fertilizer or nutrients you may find at your local garden center. You will be able to provide yourself with fertilizer year after year, simply by reusing what you would normally discard as waste. Another added benefit of switching to compost is that it is much less harsh on the root systems of your plants than chemical fertilizers are. Chemical fertilizers can be so harsh, in fact, that it is not recommended for you or your pets to touch the product. Overall, composting is inexpensive, safe for the planet and great for your plants. Is there a way to compost on a larger scale? 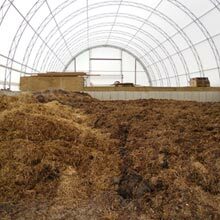 If you would like to make composting a part of your farm or business, you should consider purchasing a fabric structure to house a commercial-sized composting pile. These buildings provide the perfect environment for composting and heat capture applications. Fabric structures supply abundant natural light, superb air quality and ventilation. Their exceptional height and wide open space allows for easy access and handling, with plenty of room for maneuvering large equipment. 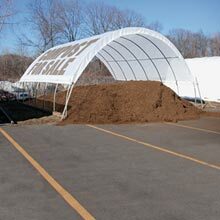 We recommend purchasing a fabric structure for composting, such as our Manure/Compost Building. This smaller, single hoop building is designed like a high tunnel to allow for ventilation and easy vehicle access. It is ideal for the temporary storage of compost for later application or sale because the cover lets in nutrient-building sunlight, while still offering protection from the elements. If you are looking to compost from start to finish inside a structure, you may want to look into Hercules Truss Arch Buildings from our affiliate company, ClearSpan Fabric Structures. These buildings are engineered to fit your needs. These structures are extremely durable and able to withstand corrosive environments because of the triple-galvanized steel frame and all-weather fabric cover. For more information on a ClearSpan composting building, please visit www.ClearSpan.com. Whether you are simply looking to recycle your kitchen waste or want to make composting a part of your business, TekSupply is here to help. Contact Us today to find out which composting system will work best for your needs. Have questions about Composting? Visit our Live Help page or Contact Us.